El Poncho Hostel is in the centre of Bariloche, at only 4 blocks from Nahuel Huapi lake and 6 blocks from the famous Centro Civico. 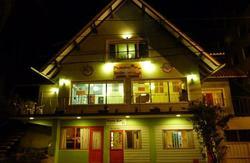 Its counts with private and shared rooms, all with private bathroom. Breakfast is included in the price of the rooms and have a totally equiped kitchen for guests. It have free wi fi and two computers available for guests. Our crew will be very glad to recommend different activities with personalize attention. El Poncho Hostel is located in Rolando and Gallardo just 4 blocks from the lake Nahuel Huapi and 6 blocks from the famous Centro Civico. Is in the centre of Bariloche city. It very easy and accesible to arrive. From the airport you can take a taxi and is only 20 minutes from it. From the bus station you can take a taxi or a bus that leaves you in front of el Poncho Hostel or only at one block from it in just 10 minutes. And if you like to make an activity you have at only two blocks away the bus stop where you can take any bus to know the different parts of Bariloche. 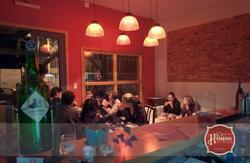 El Poncho Hostel is a perfect place to rest, have fun and in the centre of this amazing city.